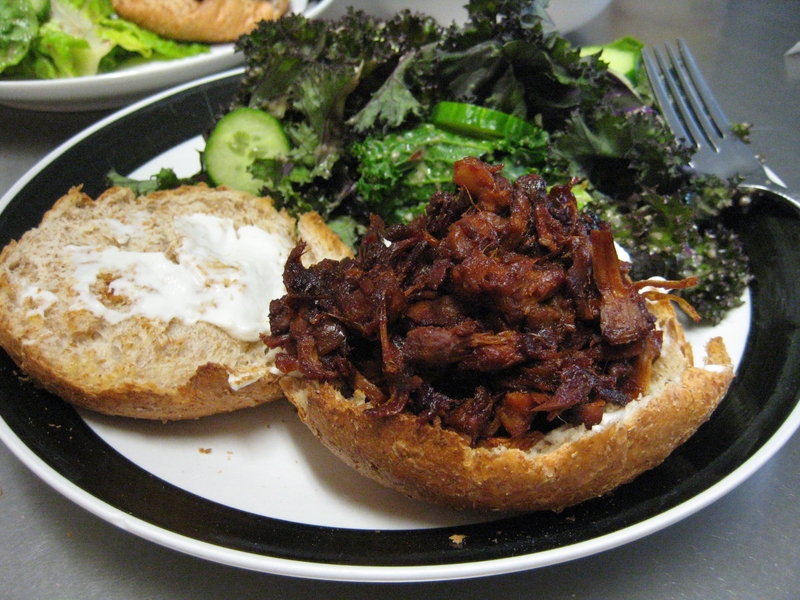 This barbeque sandwich was so delicious and easy too, I’m so glad we tried these! “How does a vegan eat barbeque?” you may ask. Enter the wonderful texture of Green Jackfruit. 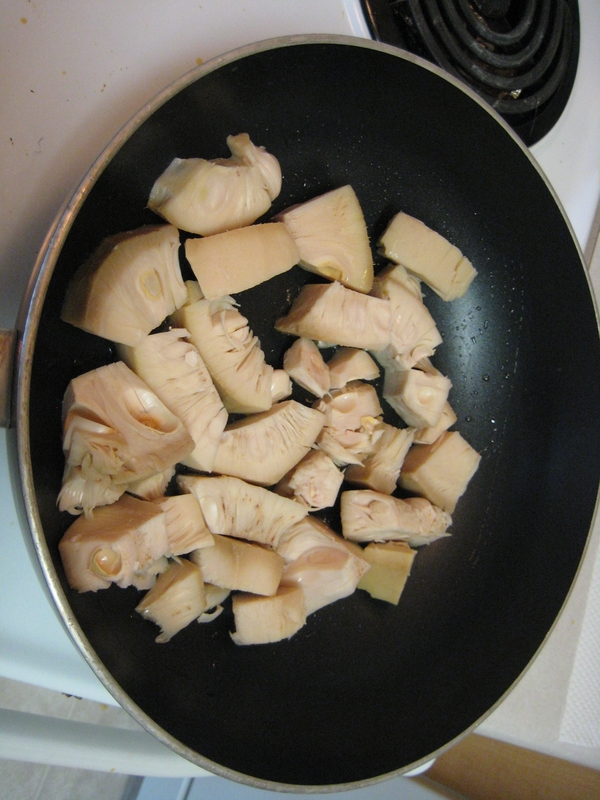 We found Young Green Jackfruit in the Asian isle at the supermarket. 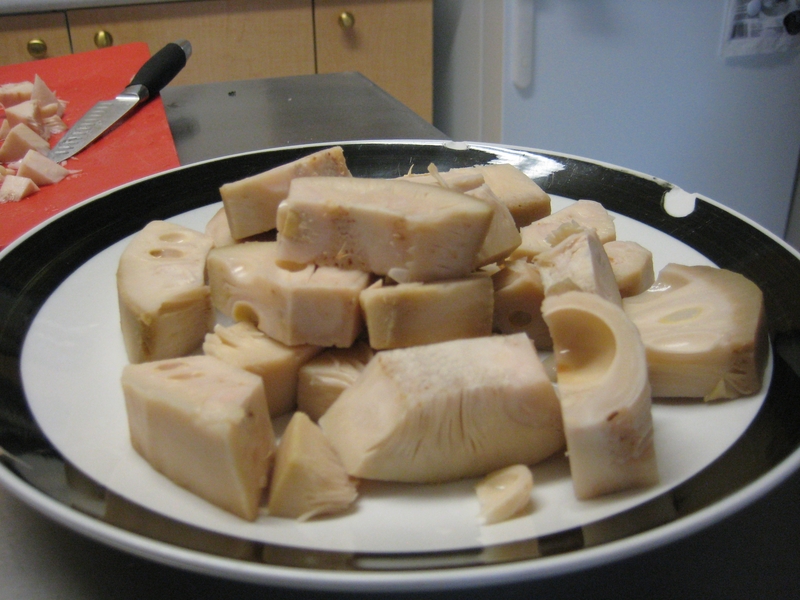 Get yourself two cans of Green Jackfruit in Brine. Green, not yellow! Also get a good, tasty bottle of barbeque sauce. We bought an organic one that was sweetened with agave. It was the best BBQ sauce eva! You’ll also want to preheat your oven to 400 degrees at this time. 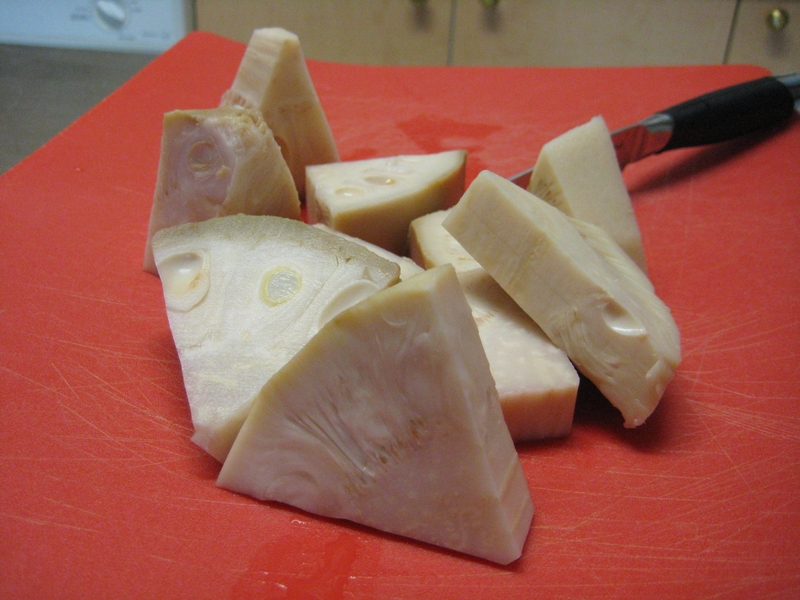 Now you know what Jackfruit looks like. Now bust it up with your spatula! Nothing exciting yet, but take a closer look at the texture. Time to get saucy. 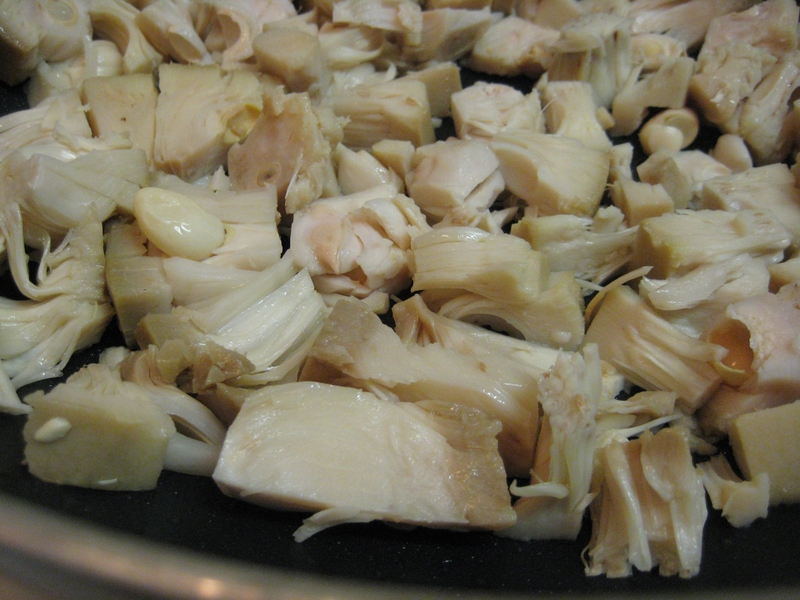 Coat the jackfruit in the BBQ sauce. We used a whole bottle for the two cans of jackfruit. Simmer it in the sauce for about 20 minutes on a lower temperature. 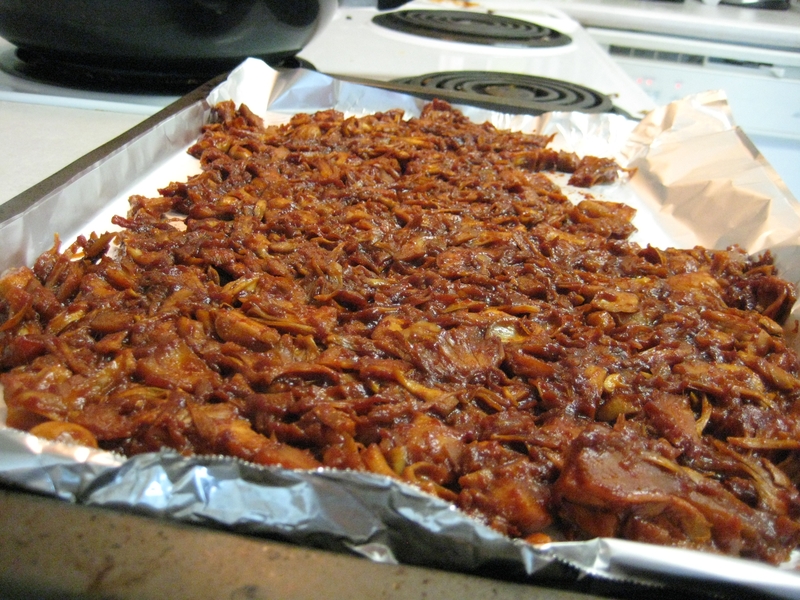 Next, spread it over a baking sheet (covered in tin foil if you want less mess). Pile the finished product on a bun and enjoy the amazing-ness!! YUM!! Thanks again Luminous Vegans for the tasty recipe! You sure do find interesting and adventurous recipes to try! I love trying new recipes. This one is a must try!! I’m making them again this week, so good! Thanks for the shout out! 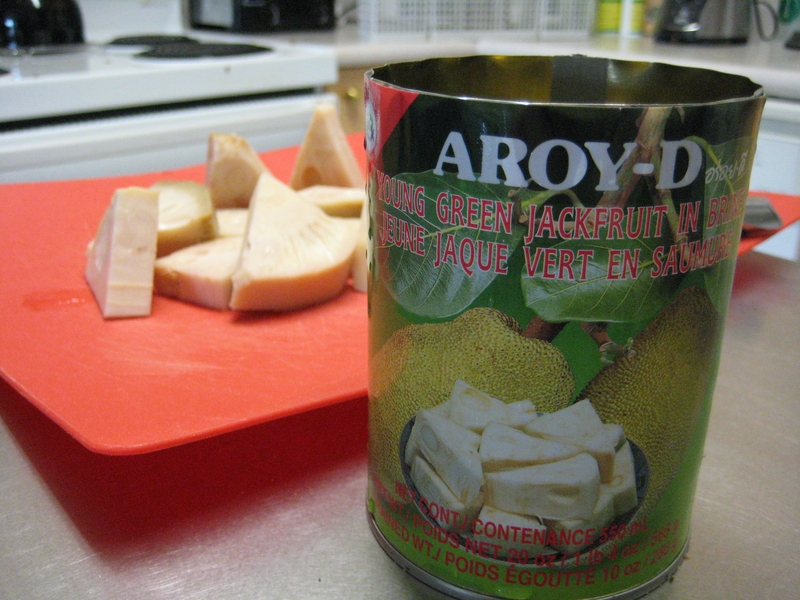 I am glad you were able to find some green jackfruit. 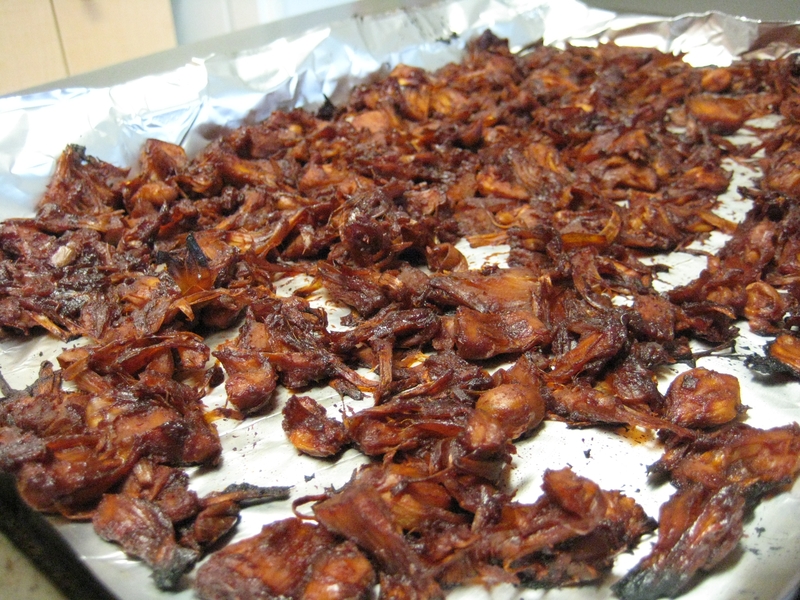 We recently made some for a party where we used them in Korean BBQ style tacos and the omnis loved it! I am starting to appreciate them plain too and find myself popping some in my mouth while cutting them. So glad I did! Yum those tacos sound amazing too. I’m sure the jackfruit can be so versatile, I’ll have to dream up some ideas on other ways to use it too! They are so easy and good!! Enjoy! Hey Ash, great blog! My brother actually made this for me when he had a dinner at his house and was serving pulled pork, and this was the veggie option he cooked up for me! Can’t wait to see what you cook up next. ← I’ve Discovered a Dairy-free Yogurt Made From Almonds!